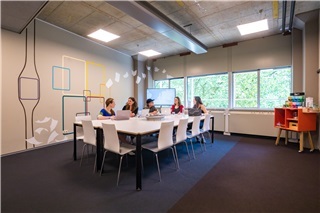 De third space becomes reality in this 3.0 meetingspace. 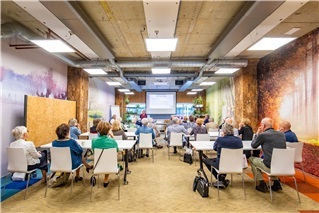 The Mindz podium facilitates events or big meetings. 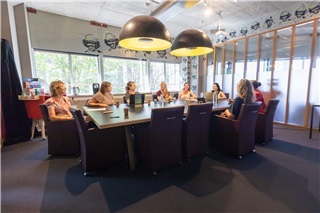 With its beamers and other multi media possibilities, it's the ideal meetingspace for sharing and exchanging knowlage. Would you like to organise a big event? You can contact us at contact@s2mutrechtcs.com for a personal offer. We are also happy to help you with the organisation or buzz around your event! 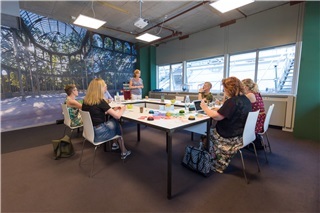 Let this meetingspace inspire you to create new things. 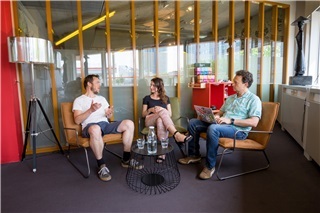 You can choose for a relaxt brainstorm on the sofa, or an more active meeting at the table. Whatever suits you best! 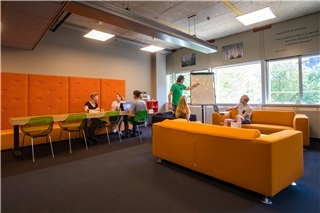 A stimulating work environment is an important success factor for creativity and innovation. It can inspire and it helps to create even better ideas. By using special techniques and a clear phasing, the creation of good ideas and/or solutions can be stimulated. Think out of the box by looking outside to find the lines of your own solutions in space. Classic with a wink; chandeliers and warm colored walls, but also wireless internet and a beamer. 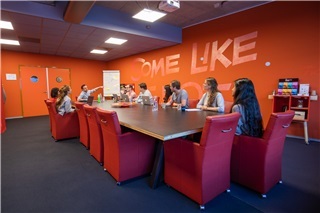 In this meetingroom are multiple settings possible, so we can provide a meetinspace completely according to your wishes. 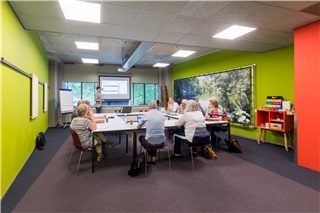 In this meetingspace you go back to nature as if you are having your meeting in the forest! A peacefull, natural atmosphere will give you the perfect setting for your meeting. Surrender to this luxury setting in The Dom Suite and enjoy the view of the cathedral. What else do you need? 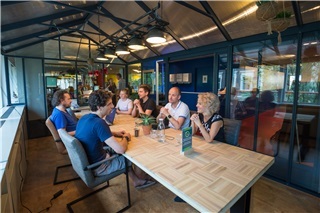 This meetingspace is the greenhouse for your ideas. A breeding ground for inspiration. Every setting is possible, whatever suits you best! To the beach and yet a succesful meeting? 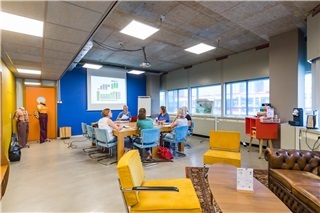 It's possible in this meetingspace! You won't have the distraction of a real beach, but the atmosphere will bring just the refreshing breeze your need. Don't forget to bring sunscreen! We have one word for you: RED. Marilyn Monroe and James Dean welcome you to the 60ies! The perfect setting for a heated discussion or a very creative meeting, that's the question. But one thing is sertain: you will be seated in comfortable chairs! Perfect for your traditional meeting. Almost every setting is possible; cabaret, square, theater or a circle, you name it! Out of the box and innovative, just like the art of the Dutch artist Gaby Gaby. Inspiring an stimulating in a way you least expect it. 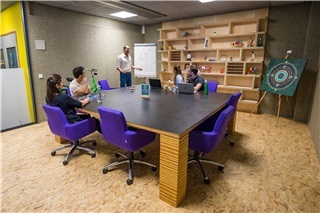 Business or brainstorm, everything is possible in the Gaby Gaby meetingspace. 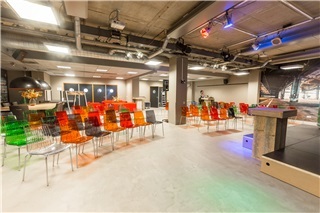 Discover your naked tracks in this meetingspace. 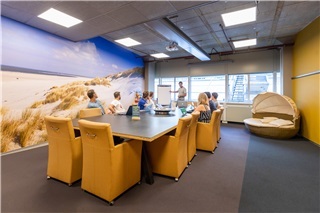 Coaching or brainstorming, just take a seat in this luxurious meetingspace and walk the unexpected road! The orange walls let the sun shine in this meetingspace. Every meeting becomes a joy! Which setting would you like? Just let us know, we will take care of it as this is a flexible meetingspace. The cornerstone of Blue Ocean Strategy is 'Value Innovation'. A blue ocean is created when a company achieves value innovation that creates value simultaneously for both the buyer and the company. Let the ocian inspire you and have a refreshing meeting! We had a design contest for our 'mesh', and the winning concept is a 50s / 60s Loft, designed by Marcella Vermeer. She is a designer from "De interieurtipgever". 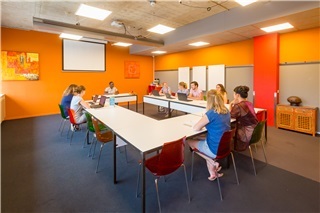 You can have a traditional meeting in this meetingspace as well as the possibility to have a short break-out or to prepare your meeting at the relaxing couch. You can feel and touch the vision bihind the concept of Seats2meet.com in the Living. Books and other objects that lead to the concept are available on the book shelves. On the couch or at the table, just grab yourself an espresso and feel at home in our living. 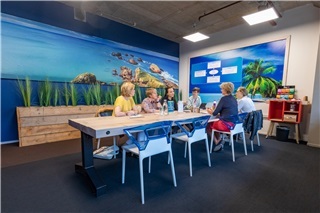 Let this meetingspace inspire you! Work becomes an art if you can inspire each other and create new things. You can inspire eachother best in an informal environment. Relaxed on the couch! Gray changes to green. The room is a beautiful 4-seasons meetingspace with a rural ambiance. Suitable for all kinds of meetings because of the flexible decor. Just tell us about your wishes! Would you like to organise a big event? Send us an email to contact@s2mutrechtcs.com and we create a special proposal for you. We will also be glad to help you organise or with the online buzz! 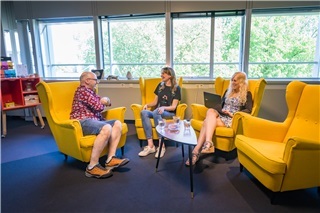 Feel connected in this meetingspace! It will encourage an active and informal meeing. High chairs and a high table create an open and inspiring atmosphere. 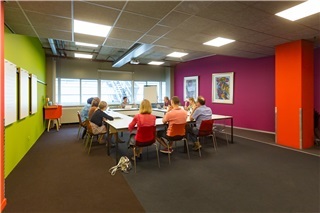 This meetingspace is also suitable for standing up, to be even more active! Your entrance is immediately your space: Serendipity. This is what Seats2meet stands for: stimulate the unexpected relevant connection. You can meet at a large table in this transparent room. The light falls from all different sites. This room is located next to the reception, giving you immediate help when you have questions. The Stage in the heart of the location. 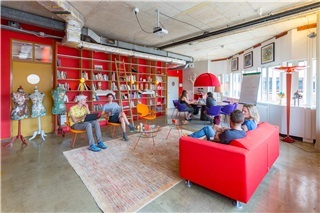 A private space that connects with all the workspaces. Meet in comfortable chairs at a nice spacious table. Because of the glass wall the light is filling this space which stimulates creativity and serendipity.